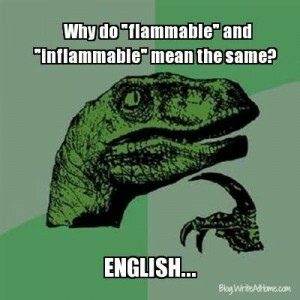 I immediately thought it was weird when I learned that flammable and inflammable mean the same thing. I get it now: inflame means “to burst into flame,” so inflammable means “liable to burst into flame.” But that in- at the beginning just looks so much like a negating prefix–like in injustice, indivisible, inactive, inattentive, inadequate, etc–that it seemed crazy the two words aren’t opposites. But contronyms are even weirder. 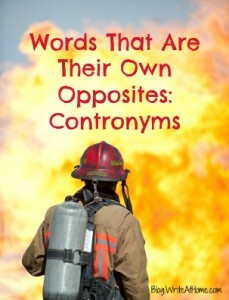 The word contronym is a recently coined neologism. It refers to words that have definitions that are opposite of one another. There are words–common ones, mind you–that mean the opposite of themselves in certain contexts. If I give an apology for my actions, I admit being wrong. If I offer an apology for my faith, I defend my belief as right. If I bolt the room, I leave in a hurry. If I bolt myself to the floor, I cannot leave. If I am bound for Idaho, I am going there. If I am bound to my chair, I ain’t going anywhere. If I cleave a watermelon, I divide it in two. If I cleave to my spouse, the two become one. If I clip a coupon, I cut it out of the paper. If I clip the coupon to the paper, I attach it. A custom is something common to lots of people. A custom design is specially for one. If I move fast, I go quickly. If I am made fast, I don’t move at all. If I have a fine meal, it is exceptional. If my performance was fine, it was just okay. First degree murder is the worst kind. First degree burns are the best kind. If I garnish a dish, I add nice things to it. If I garnish your wages, I take from them. If I give out gifts, I distribute them. If supplies give out, there are none to distribute. If the land is sloped, it has a grade, but if I grade it, I make it horizontal. If I give you a handicap in competitive sports, it is to your advantage. If you have a handicap, it is to mine. If I hold up my end of the bargain, I act. If there is a hold up, there is no action. If I lease you my house, you pay me to live there. If I lease it from you, I pay you. If there were three people in the room and two left, there was one left. A model plane is an imitation of an actual plane. A model citizen is an example to imitate. If a light goes off, it stops working. If an alarm goes off, it starts working. If the lights are out, you can’t see anymore. If the stars are out, you can see them. If I work out of an office, I am inside it. If I am out of the office, I am outside it. If I have oversight, I am responsible. If I make an oversight, I fail to be responsible. A refrain is something you repeat. If you refrain from doing something, you stop. If something is rock solid, you can’t move it. If you rock it, it moves. If I sanction something I can either be approving it or boycotting it. To screen something is to look at it. If something screens you, it keeps you from looking at it. If you seed a field, you put seeds on it. If you seed grapes, you remove the seeds from them. If I shop at the mall, I buy things. If I shop something around, I try to sell it. If something is skinned, it may either be covered or have had its covering removed. If I splice the film, I cut it in two. If I later splice it, I join the two into one. A strike in baseball means trying to hit but missing. Everywhere else, a strike is a hit. If I temper my anger, I make it softer. If I temper steel, I make it harder. If I throw out an idea, I present it for consideration. If we decide to throw it out, we discard it. If something is transparent, it’s easy to see, or it’s invisible. If I trim the tree, I put stuff on it. If I trim the grass, I cut stuff off of it. A variety of can mean many types or a single type. If I weather the storm, I endure. If the wind weathers the mountain, it erodes. If I fight with someone, I might be fighting against him or alongside him. Again, some of these require a bit of a stretch, but they are still unquestionably opposites in some sense. 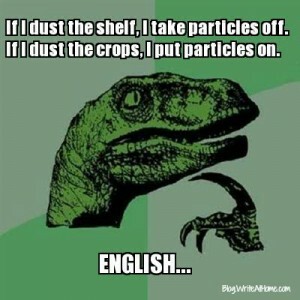 Just another oddity of English. Your comments are always welcome. Feel free to leave a reply below. In the “goes out” v. “comes out” the meaning is affected by the verbs not the use of out. “Goes” implies movement away from. “Comes” implies movement toward. Immo in Latin can mean “No” or “Yes”, which makes it very difficult to translate.